"Love, my Brother, forever. Julia"
Raymond Eugene Morber, 57, formerly of Gorham, passed away at 2:16 a.m. Wednesday, October 24, 2018, at Memorial Hospital of Carbondale. Raymond was born January 4, 1961, in Murphysboro, Illinois, to Clarence "Cub" Morber and Catheryn (Black) Morber. He loved to be a participant in the Special Olympics and enjoyed traveling to State Games. He loved all his medals whether it was first place or last place, and he was very proud to have received them. In 1979, he was the poster child for the United Way Special Olympics and he participated in gymnastics in the International Special Olympic Games held in Brockport, New York. 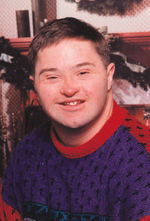 Raymond loved all sports especially the Special Olympics. He was an avid Cardinal fan, Dallas Cowboy fan, and Saluki fan. Raymond had worked for S.T.A.R.T. doing several jobs from working his way from sorting to janitorial work. Mr. Morber was a member of the First Baptist Church in Murphysboro. He was preceded in death by his parents, two siblings in infancy, and two nieces. Gravesite services will be held at 11 a.m. Friday, October 26, 2018, at Pleasant Grove Memorial Park with Rev. Shaker Samuel officiating. The family would like all donations be given in memory of Raymond to the Special Olympics of Southern Illinois Region K, 1740 Innovation Drive # 23, Carbondale, IL 62903. For more information, please visit www.pettettfuneralhome.com. "Raymond brought so much love to our family, he will be sadly missed by all who knew him."